This time of year, stroll down the tool aisle of any garden center and you'll find a vast array of cutting instruments, all designed with the backyard gardener in mind. Blade heads of short-handled pruners and long-handled loppers usually come in two different styles: bypass and anvil. Bypass loppers or pruners have a stainless steel curved blade that uses a scissors action to pass next to, not on top of, the lower surface, sometimes called the hook, designed to catch and hold the branch while the cutting blade comes down. The cutting blade of anvil-style pruners comes down onto the center of a soft metal or hard plastic lower surface, called the anvil or table. Bypass pruners offer a cleaner cut, as the blade slices all the way through the stem. Anvil pruners tend to crush the soft tissue of the stem, stopping the flow of nutrients, prolonging the healing time for the cut surface. Despite the bypass pruner's benefits, garden centers still offer a nearly equal number of anvil-style pruners and loppers, a never-ending source of confusion for the gardener hunting for cutting tools. So, we asked area garden experts their pruning preference: bypass or anvil? Sacramento County Farm Advisor Chuck Ingels prefers bypass pruners. "I never use anvil pruners because you often can't cut close enough to the branch collar without leaving somewhat of a stub," says Ingels. "When they begin to wear, they often don't cut all the way through. Also, they crush the bark, which bypass pruners can do also, but you can turn the shears so the blade is closer to the collar and make a clean cut." "I don't use and usually do not recommend anvil pruners," says Luanne Leineke, Community Shade Coordinator for the Sacramento Tree Foundation. "I tend to see too many wounded branches, particularly when the bark is soft. I suggest using bypass pruners for up to three quarters of an inch-thick branches, loppers for up to one inch thickness and a hand saw for anything larger." 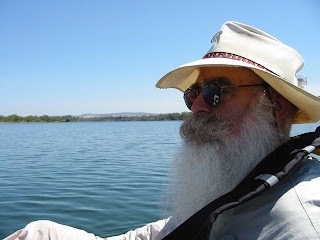 Pete Strasser, former plant pathologist with Sacramento's Capital Nursery, has only one use for anvil pruners. "Anvils are for deadheading annuals, and that's about it." Loren Oki, Landscape Horticulture Specialist with UC Cooperative Extension in Davis, also has limited use for anvils: "I was taught that bypass pruners were used on live material, whereas the anvil types were better for dead wood. The bypass type cuts cleaner through the softer material without causing much damage." 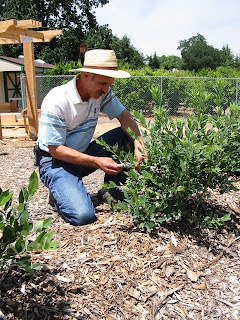 Steve Zien, owner of the Citrus Heights-based organic landscape consulting business, Living Resources, leaves no doubt to his preference: "I would never use anvil pruners! Never ever, unless something needed to be pruned right then and there, and it was the only tool I had beside my teeth." I've been wondering why anvil pruners and loppers are still made. Now for a debate re bypass pruners: Felcos versus Fiskars! Red versus orange! Pruners at dawn! That is a wonderful idea!!!!!!!!!!!!! I love my bypass pruners, and was quite beside myself when they went missing for a few days. They reappeared today...(sigh of satisfaction). But, recently I heard of another type pruner, a ratcheting pruner that sounded like it could be useful. Would you care to comment? I have used ratcheting loppers, but never ratcheting hand pruners. But I am unfamiliar with any ratcheting bypass hand pruners or loppers. All the ones I have tried were anvil ratcheting loppers. Ratcheting action certainly makes it easier to cut through a branch that may have been too large for the tool you were using. Generally, if the branch thickness is the size of my little finger or less, I'll use hand pruners. If the thickness is somewhere between my little finger and thumb, I'll use long handled loppers. Thicker than my thumb? I use the pruning saw(s). Hand saw for smaller branches, a bow pruning saw for larger branches. When using a bypass pruner, should the hook be futher away from the branch base than the cutting blade? I have always found I got better leverage by positioning the blade and hook as far in as possible onto the branch to be removed. Interesting comments on the Anvil vs Bypass lopers/pruners. The one comment that really helps me is the one made by Loren Oki... I can see how an Anvil loper/pruner would be great for cutting dead wood. Dead branches are quite hard to cut and I think that they are hard on my Bypass tools so I think I'll now use Anvil tools for that purpose. Thanks Loren! I'm surprised to see such old posts for this topic. Recently extended handle such tools are available at one third of their primary prices. These tools aren't only for "gardners" Lot of prunning can be achieve easily with such tool. Yes for dead wood or Anvil type is better but it works well also on green wood. These days where recycling is more in peoples mind "green" can be much reduced for council collection bin with such tool. For heavy cutting Anvil is better but this tool is also heavier than its bypass counterpart. So I find bypass equivalent tool easier to use for lighter branches, and yes green. I'm actually thinking of ratchet tools. My first purchase was some 15 years ago and the deal was both secator and Anvil heavy ratchet pair for some $120 Aussie money. The secator (also anvil) gives an amazing power, as for the lopper with its extended handle would go through quite a thick branch when you got to know how to use the ratchet. No argument about the clean cut from a bypass tool. But certainly one would benefit from both. 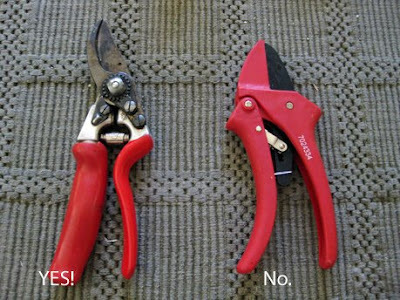 It is clear that many of the people interviewed have not been taught the proper use and intention of each type of pruner. There is a lot to be said for using the "right tool for the right job" not only for the good of the plant, but also for the good of the tool. Improper use can easily dull the tool. "With a bypass cutting tool, you draw a curved or straight blade past another blade, this creates a scissor-like motion that works well for cutting live green plants. The spongy, firm outer wall surrounding the stem yields easily to that bypass motion. With an anvil cutting tool, you bring down a straight blade against a wide anvil usually made of steel or hard rubber. 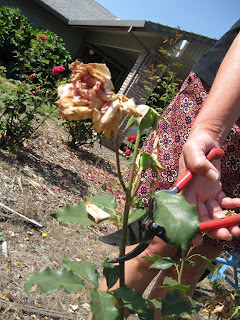 Anvil pruners are better suited for dead and dried-out plants, the crushing motion causes the brittle stem to kind of explode and separate. Choosing the wrong tool for the job can frustrate your pruning project. A bypass cutter used on a dead plant causes the brittle stem to bend and get caught between the two blades as they glide past each other. This can damage the bolt mechanism holding the blades together, reducing the tool's cutting effectiveness. And when you try to cut a live plant with an anvil, the spongy stem tends to crush, even with a sharp blade, resulting in a jagged cut and causing damage to the live plant." Absolutely correct. Bypass is for living tissue, anvil is for deadwood or primary cuts on long branches before the finer finish cut. Using bypass pruners or loppers on dead wood will dull the blade, exert great lateral pressure on the blades and pivot pin and will eventually warp them so they will no longer make a clean cut. Precision in anvil pruners is less critical, warping less likely, and unless extreme, and will not effect the tools usefulness. Anvil are terrible secateurs, but are better than bypass/parrots for loppers (especially my S&J anvil telescopic ratchet loppers - the greater power gives cleaner cuts as bypass blades can get forced apart and break). The best secateurs are Wolf Garten bypass secateurs with the between-handle spring actually being a sprung bar hidden in the handle, which is not too sprung (less grip fatigue) and not too weak (less often getting stuck shut) - far more robust than those actual exposed spring designs (caterpillar cocoon, which rust to death). The Wolfies also have the best lock design - a slide button (not too loose, not too tight) which doesn't flap about and get in the way, like the usual design. At only £12 they're amongst the cheapest too. I have purchased a few different brands of bypass pruners and loppers with ratcheting action. They're my favorites. In fact, I was first introduced to the concept of ratcheting garden cutters at the Philadelphia Flower Show about ten years ago, where I bought a very nice set of ratchet bypass loppers. At one time Fiskars was making at least two models of bypass ratchet pruners. I have noticed, to my great annoyance, that many sellers and manufacturers seem to think that the ratcheting versions *must* be anvil types and so don't bother to indicate anvil or bypass in their product descriptions. It makes shopping for what I want--ratcheting bypass pruners and loppers--unnecessicarily difficult! Your tips are really great.I got great information that i really didn't know.I appreciate your for sharing great information with us. Is All Gardening Local? Ask the Snarky Farmer! Name that Late Summer Weed!